The theme for week 12 in the 52 Ancestors in 52 Weeks series is “Same”. I had a rough time finding something that I shared with an ancestor. Then, it hit me. It was so obvious! We’re all short. By “all”, I mean my Dad’s side of the family. My Mom’s side was not short. But, my Dad’s side? Definitely height challenged. We used to get a kick out my Dad. He swore up and down that he was Five Five and a Half. That half of an inch being very important. The funny thing was he was shorter than my brother who was 5′-5″. When we’d say something, my Dad would get mad and claim we were measuring wrong. 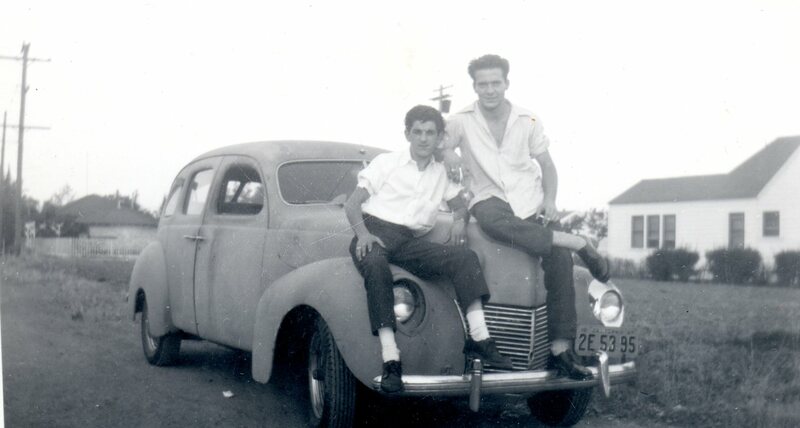 This is my Dad (on the left) and his best friend, Don “Koty” Kotis, ca 1949. When my Dad first tried to join the army about this time, the recruiting officer told him he was too small. His advice? Go home and eat some bananas. They drafted him in 1951 for the Korean Conflict. I guess they weren’t as picky then. My Dad’s siblings were all short as well. They ranged from 5 feet to about 5 ‘ 6″. The lack of height came from both sides of his tree. 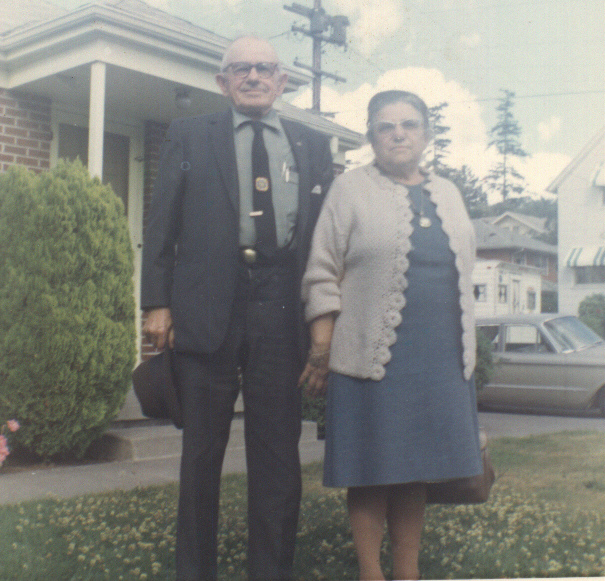 My grandma, Anna (Mazeres) Lassalle, was only 4′ 8″ and I believe my grandpa, Jean Lassalle, was only 5′ 4″. There was a story passed down that my grandpa used to love to take my grandma places, especially the circus, when they were dating. She got in for the child’s price which saved him money. The shortness slipped into my generation. Only one of us broke the 5′ 5″ marker. That’s my oldest brother. He got some of the height genes from my Mom’s side of the family and made it to 5′ 9″. The rest of range from 4′ 9″ to 5′ 5″. I come in at 4′ 10″. I am two inches taller than my grandma. Just wait until shrinking sets in. When I went to kindergarten, I was the same height as the other children. When we came back from summer vacation after kindergarten, I was in the middle. By the end of 1st grade, forget it, I was one of the two shortest with a boy named Johnnie Taylor my competition. My sister’s husband’s is 6″ 1″. She is 4″ 8″. They never had kids. It would have been interesting to see whose genes won out. Before they were dating, he would drive by our house and refer to as the house where the little people lived. Hey, buster! There was a Portuguese family down the street that was even shorter than us! Little did he know he’d be stuck with us later on. I’ve always been curious about our height, how much is determined by genes, and how much is determined by other factors such as nutrition during the growing years. I am fascinating how the height genes were divvied up between my nieces and nephew. My tallest brother married a woman with tall genes in her family. Their daughter and son are 5′ 9″ and 5′ 8″respectively. On the other side, my brother who was 5′ 5″ married someone with short to average height family members. They have two short daughters. They’ve got Lassalle written all over them. The oldest has stopped growing at 4′ 8″. The youngest is 4’ 9″ and may have an inch or two left in her. Though, the odds of her reaching 5 feet are slim to none. This is a photo of my grandparents ca 1960. It was taken in Oakland, California. We used to joke about how short they were and call them the Little French people. As if we were any taller!